Tracks on the Wharf, Finally! Two legs of the wye complete. I have installed the tracks on the wharf and have two legs of the wye installed. The two turnouts on the wharf are controlled by a single double slip switch. The double slip allowed me to maximize the length of the sidings on the wharf. Each track can hold about 10 cars, or 8 cars and an engine. Since I only have 14 cars in total now, I can fit the whole roster on these tracks. All seems to be working well using a battery powered locomotive to test, as I have not added wires yet. The transfer bridge to the car float will be added at the far end of the wharf, but I don't plan to move the car float during operations. The last leg of the wye also includes three turnouts, so that track will take a while to install. I am making progress on the track playing at Aquia Landing. All the rails are on the wharf and I am proceeding to install the wye. I was able to test run trains on the wharf using my battery powered locos. Things are working well, but I still am in work-in-progress mode as evidenced buy the tools scattered all over the layout. Just three turnouts to go, however, the last section of track is on Burnside's Wharf, so the progress will be slow. 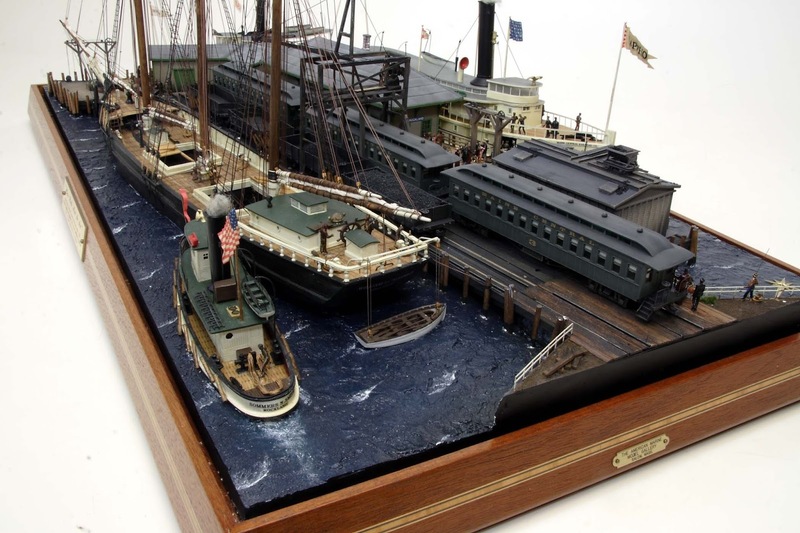 In the meantime, I would like to point out two wonderful dioramas that are for sale American Marine Model Gallery. These charming waterfront dioramas built by William Hitchcock depict waterfront scenes in Maine where rail cars interchange with steam and sailing ships. The first is based on Rockland and the second at Frenchmans Bay. I've always liked the Rockland Branch of the Maine Central RR. It had a lot of interesting activity including waterfront scenes, numerous industries, and interchanges with narrow gauge railroads. I understand Bob Hayden's new layout is depicting that branch. I listed his old layout in my top ten that I have visited, so I eagerly await development of his new project. 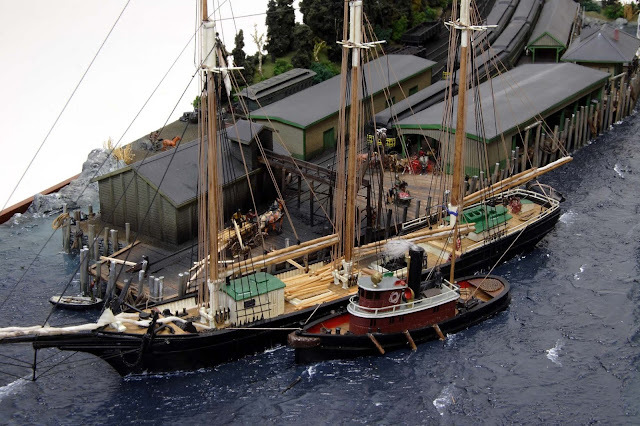 Last Saturday a group of O scale modelers visited the house to see the Aquia Line. Yes, the Aquia Line finally got some love. The O scale group is an informal association of people that model in O scale or are interested in O Scale. They are largely from the Middle Atlantic area. The guests included Gary Eames, Eugene J. and Carolyn Nash and their son Gene, Jr. (who was dressed in a Union Overcoat), Ted Rabusseau, John Sethian, Terry Terrance, Karen and Jim Kinder and their daughter (she didn't record her mane), Doug Gurin, Nick Kalis, and Rick Wright. John Barry helped out by running trains for the visitors. Alicia and my mom helped out with snacks. Not everyone signed in so I may have missed a few guests. If you want to be listed be let me know. Later Brad Trencamp stopped by to pick up some etchings and we fired up PoLA for a few minutes. On Sunday I proceeded to lay the track on the wharf. Yes, eight years into the project tracks are finally on the wharf. Instead of two turnouts on the wharf, I decided to build a double slip switch. I used Alkem Scale Models photoecthed switch stands for this. I designed the etchings to allow the stands to be used in double slip and three-way switches, but this is the first time I used them in such as application. This will be a good test. I decided to space the tracks on the wharf at double the normal spacing. This was due to the close spacing of cars on the car float. If the tracks were close enough to serve adjacent spots on the float, the gap between the cars would be very small, too small for operator fingers. By gapping the tracks this way, operators can get their fingers around the cars without trouble. I can change it back if I decide it doesn't look right after cogitating on it a while. As of Monday morning, I decided after checking prototype photos to move the tracks closer together. I don't have any photos of the transfer bridge at Aquia, so I will probably replicate the design that the USMRR used in Alexandria, but for two tracks instead of three. There are photos two other examples of USMRR transfer bridges I have seen. Both of those are one track transfers, but the wharf at Aquia Landing definitely had two tracks. 1.1. Please read this complete document so you understand yours and the other players’ roles. 1.2. If you notice a problem, please bring it to our attention. If you derail a car, please re-rail it carefully. If you are unsure about something, please ask. 2.1. You are in charge of the train. You will instruct the engineer and brakeman on what to do. We normally run 2-man crews, but can go to 3 if people are available. If using 2-man crews the conductor is also the brakeman. 2.2. Movements on the layout are controlled by early 19th century Time Table and Train Order rules, which are simplified versions of the currently used rules. You will find some train orders and a schedule for the trains in the packet you receive. The train orders will provide any special instructions. You should consult the schedule to understand any meets with other trains or other events you must consider. 2.3. In the packet, you will receive a replica copy of the USMRR Conductors Report. Please fill out the top with the names of the operators on the train. This form will act as your switch list. It will tell you how many cars are in your train (probably 4-6) and where they should be spotted. It will also list cars that you must pick up. You should verify that the cars you are pulling are correctly listed on your sheet. Make any corrections as needed. 2.4. Any cars not listed on the papers but found at stops along the railroad must remain in place, though they can be shuffled around if necessary as long as they end up where they started. 2.5. As you work you may mark up the switch list and add notes. When you are done, please turn in the switch list for our records. 2.6. Maximum length of train is 6 cars plus locomotive. Longer trains may be allowed if you have no scheduled meets. Check with the dispatcher before deciding to haul more than 6 cars. 2.7 Conductor cars (also known as “way cars,” or rarely in this era, “Cabooses”) are not yet available. You will notionally ride on the engine with the engineer. 2.8. Do not use the extended link on the cow catcher for switching. Make all your switch moves from the rear of the tender. They are not designed by the model manufacturer to operate and I have not built operable replacements. 2.9. Your train should display proper signals. In daylight, white flags for a single scheduled train, or red flags if an extra is following. At night, colored signal lights will be used instead of flags. Note this is somewhat reversed from later practice. Yes, it will be confusing if you are used to modern practice. 2.10. Pusher or double headed engines are not used in normal operations. 2.11. The clock operates in real time. There is no fast clock. 3.1. You are in charge of the locomotive. You will control the throttle, bell, head light whistle, and engine servicing. Please familiarize yourself with the throttle and the special functions. There is a cheat sheet on the back of the throttle with the controls appropriate for the loco. 3.2. Do not run with the headlight on in daylight. Whale oil was expensive and reserved for night time use. 3.3. Ring the bell when passing or near depots. Ring bell when stating the loco from stop. 3.4. The engine decoders have momentum programmed in, so be aware of that when starting and stopping. 3.6. Use the appropriate whistle signals when moving the engine. 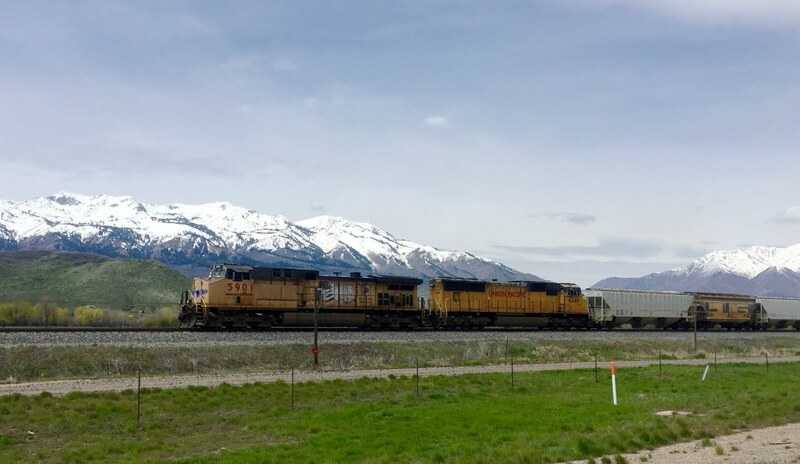 1 Short - Apply brakes2 Short – Release brakes3 Short – Backing train4 Short – Call in flagman (McCook’s Landing is in terminal limits, so you need not flag your train. )5 Short – Wood up1 Long – Danger. 3.7. To service the engine you must park by the wood rick and water tank to replenish water and fuel. Use the sound effect function to simulate the water filling operation. You do not need to move the hose or lever on the tower. Wood loading is simulated by a 2 minute wait by the wood rick. 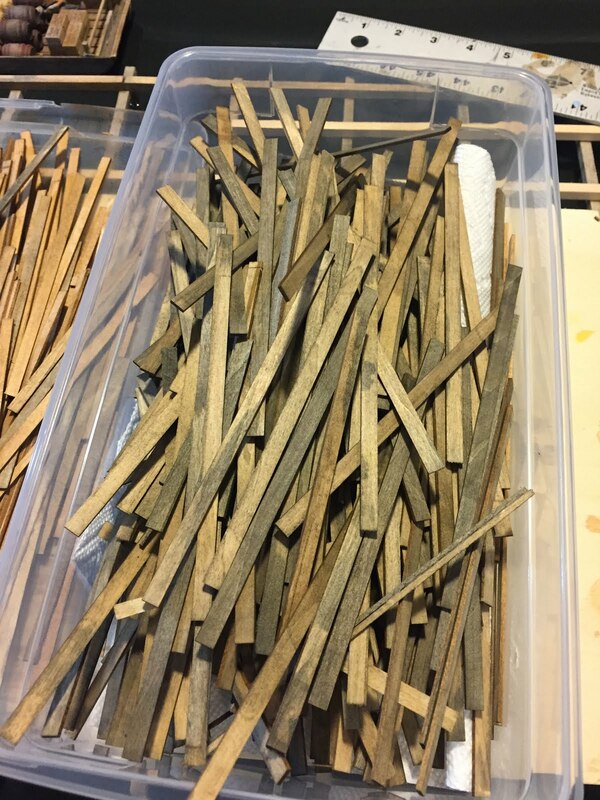 You do not have to actually load the wood. There are water towers and wood ricks at Aquia Landing, Brooke and Falmouth. 3.8. Do not exceed 5 miles per hour when crossing the bridge. Do not use excessive speed when switching. 3.9. You will turn the engine when necessary on the turntable. It is manually operated and aligned. Ask if you need help with it. It has an automatic reverser circuit. 3.10. Please turn off the throttle and return it to us when you are done. 3.11. If the engine stops running during operation, it could be a dead battery. Please let us know if that happens. We have a spare engine in case this happens. 4.1. You will couple and un-couple cars, set the switches, and operate the brakes in accordance with instructions from the conductor. You will guide the engineer during these moves with hand or verbal signals. 4.2. The cars use link-and-pin couplers. We use magnetic pins and laser-cut resin-impregnated paper links. They will take two hands to operate. You will be given a brake staff to use. It has a rare earth magnet on one end to grab the pin and a taper on the other to help manipulate the link. Use the magnet end to pull and place the pins. If you are careful the magnet will only grab one pin when you go to pull the pin on adjacent cars. If you accidently pull two pins, replace the one you did not wish to pull. 4.3. It may be necessary to use your fingers to set the links. That is OK. Just make sure they don’t get crushed when coupling the cars. 4.4. Place the unused pins and links in the plastic bag we provide. Try not to lose them, but we do have extras. 4.5. You will throw the switches using scale sized switch stands. Do not force them. They should operate smoothly and lock in place. Visually inspect each switch to insure it is properly set. 4.6. Some of the cars have working brakes. Make sure these are all released. We will not use the working brakes in these operation sessions. 4.7. Please make sure you return the brake staff when you are done. We do not have many extras. 1. Do not use the curved turnout that is north of Falmouth behind the engine terminal. It is scheduled for removal. 2. The switch stand to the rear siding at Stoneman’s station is prone to stick. Visually inspect it to make sure it operated properly. 3. The siding at Potomac Creek is on a slight grade. Use hand brakes, or derail to hold cars if necessary when spotting cars there. 4. The rear siding at Stoneman’s Station is dead rail. Operating non-battery locomotives (Haupt, McCallum, Osceola) on this track may result in a stall. 5. All locomotives have DCC and sound. The back of the throttle has the number assigned to each engine. 6. Fury is battery powered. It has been running well lately. Use the Stanton controller for this loco. Its battery is getting weak and may not make it through a full session. New batteries and Power Supply are on hand, but not yet installed. 7. Haupt is DCC with a keep alive. It’s headlight in non-operational. Otherwise runs well. 8. McCallum is DCC without a keep alive circuit. It may stall on dead frogs in Aquia Landing. Otherwise runs well. 9. Osceola is DCC with keep alive. Osceola is an 1846 design and is a small locomotive. As such it has less pulling power than the other locos. Plan on a 4-car maximum train. 10. Whiton’s is battery powered. Use the Stanton controller for this loco. Its battery is weak and may not make it through a full session. New batteries and Power Supply are on hand, but not yet installed. I finished adding the deck to the wharf at Aquia Landing. I sanding it lightly to smooth some of the bumpy planks. Then I wiped it with a rag with Minwax Golden Pecan stain. This gave the wood the look of a new structure. 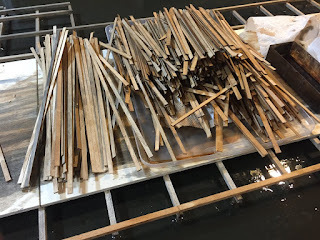 I had previously stained the planks with various shades of alcohol and inks and stains before gluing them on the joists. So the deck of the wharf has a nice variegated look. 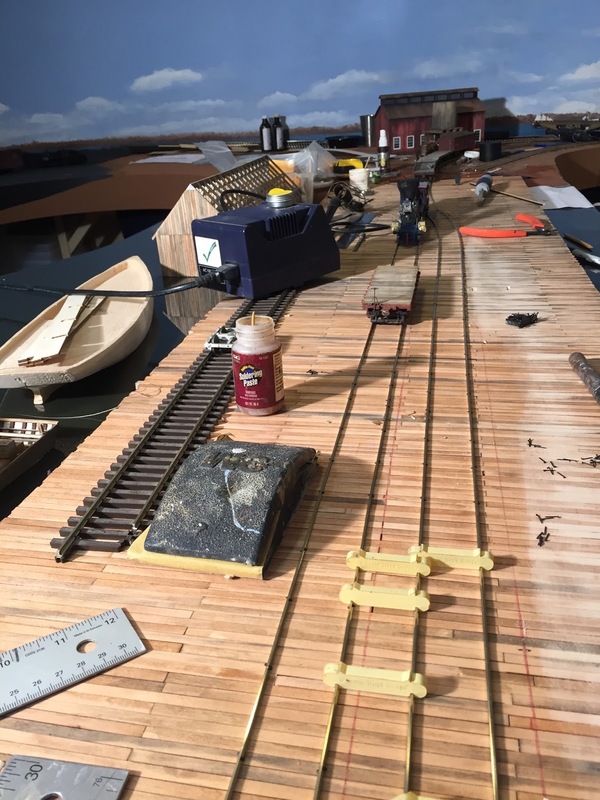 The model wharf is 8 feet long and 2 to 2.5 feet wide. I dropped a piece of flex track on the wharf and test ran a loco just to see how it will look. Next step is to lay the track on the wharf and install the wye where the wharf meets the shore. 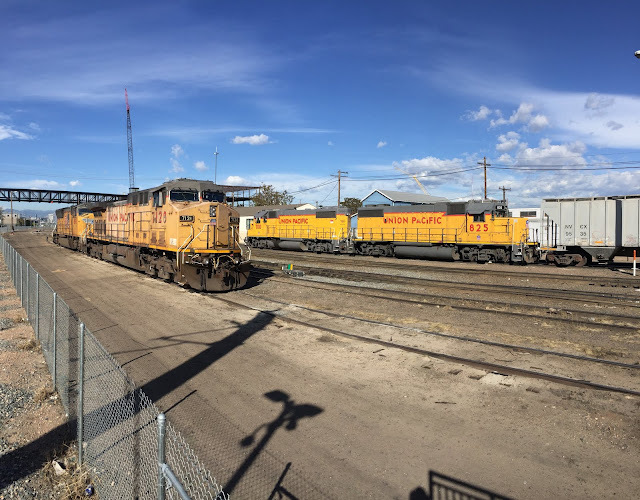 The USMRR lumber mills have been very busy lately. 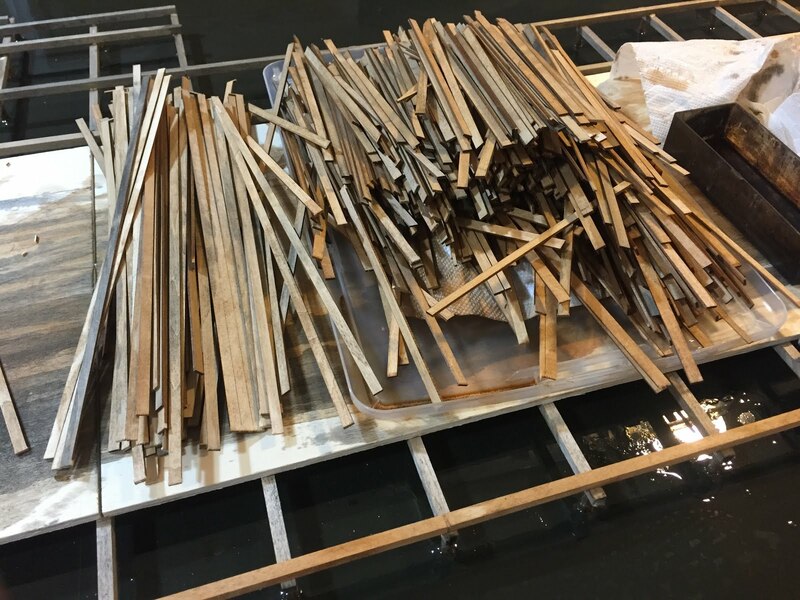 I managed to cut, stain, and install about a zillion deck planks to the wharf at Aquia Landing in between rail fanning Denver and Salt Lake City. Just two feet more to go and the wharf deck will be ready for track laying. This has been much more tedious work then I expected. Rail fanning from the Denver Rapid Transit Station at 38th and Blake.